In today’s manufacturing world, safety improvements and efficiency gains are key to staying competitive. 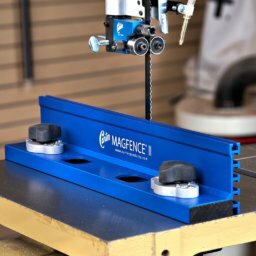 At Magswitch Technology, we focus on fully automated to semi-automated & ergonomic lifting solutions. What is interesting is the dramatic growth in Industrial Automation across a range of industries. More and more, ergonomics is playing a significant role in the manufacturing world. The jump to fully automated systems does not make sense due to capital costs and low return on investment. Forward thinking businesses are now seeing the value in investing in semi-automated equipment. 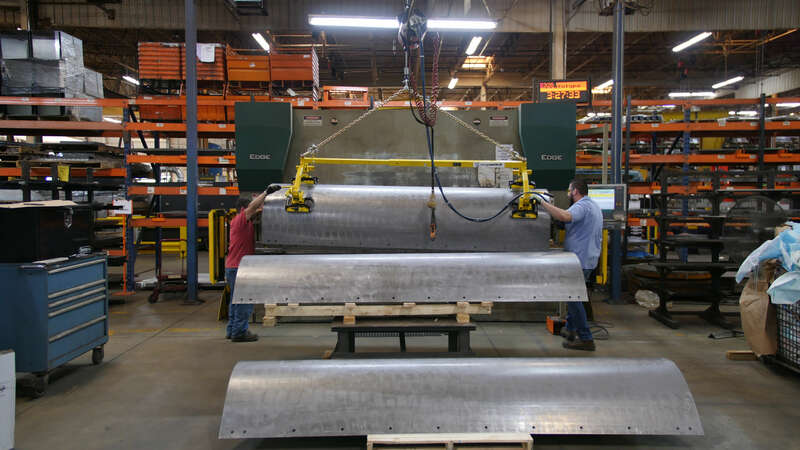 Buyer’s Products, based out of Mentor, Ohio, had recently begun looking at ways to improve productivity on their press brake line for bending snow plows. Picking the snow plows from the stack and loading them into the press brake was a slow process that hadn’t changed much overtime. 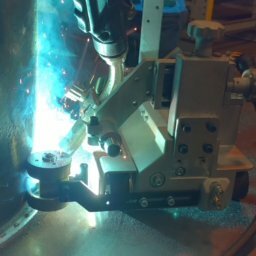 The goal was to reduce the human element as much as possible in the bending process in order to achieve a low complexity semi-automated process. By doing so, quality and safety would be improved. One of the challenges from Buyer’s Products perspective was how were the thin gauge snow plows going to be de-stacked from the pile utilizing magnets, which are much safer and efficient than the vacuum systems. 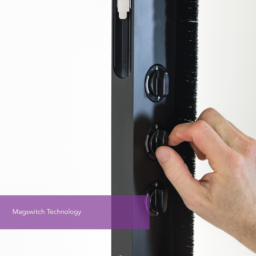 This is where Magswitch has the advantage with our patented shallow field technology that allows us to have greater holding force on thin material without compromising safety. Understanding the process was crucial to developing a solution. The first order of business with all of Magswitch’s projects is to make a site visit to see the process firsthand. Ben Walters, Regional Sales Manager made several trips to Buyer’s Products to meet with the team, gathering information and to discuss the current challenges that Buyer’s Products faced. This was followed up with multiple design reviews with Magswitch’s engineering team where ideas and concepts were shared and collaborated on. Our main objectives were to improve safety, increase efficiency and ergonomics. “The easy route with any project like this would be to minimize communication with the customer and design and manufacture a product based on assumptions. Ultimately this would lead to an unhappy customer and a sub-par product at best. 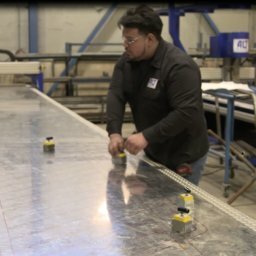 Collaborating with the customer for us is what makes these projects enjoyable and produces a product we can be proud of. This starts with design and ends with implementation” says Stephen Meinhardt, Technical Sales and Applications Engineering Manager for Magswitch. 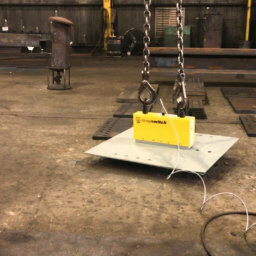 The final result was a lifting frame that utilized Magswitch’s shallow field patented technology to load and unload the snow plows safely and effectively into the press brake. Speaking to key personnel at Buyer’s Products provides a clear picture into the results that make this project a success. “Conclusion is that we are very happy with the lifting device. Once we had some practice and discovered the easiest way to hook the system up, we have seen significant efficiency gains. It has also proven to be much less strenuous for the operators to complete a complete run of parts. 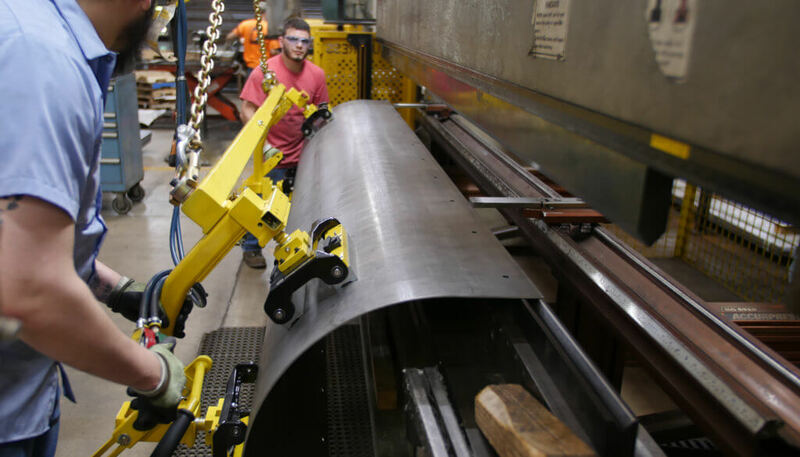 It is also apparent that we increased consistency in our bending since we were able to remove much of the human influence and can raise the plow skin in a more fluid motion,” says Evan Lumby, Continuous Improvement Engineer for Buyer’s Products.